Sometimes one hero isn't enough-sometimes you need a full dozen. First in a funny, action-packed fantasy series by the New York Times bestselling author of GONE Mack McAvoy is not an unlikely hero. He is an impossible hero! He is only twelve years old, he has a list of phobias as long as your arm, and he's a bully magnet. That is, until Mack is visited by a golem. The golem looks exactly like Mack, and has been sent to fill in for him while the real Mack sets out to save the world from the evil Pale Queen. To do so, he must assemble an elite team of twelve powerful children from all around the world. The first foe they face is Risky. Risky is pure evil. She gets it from her mother - the Pale Queen - a force of evil to be reckoned with since before medieval times. 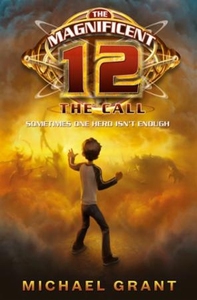 Packed with action and humour Magnificent Twelve - The Call ends with a delicious cliffhanger that will have readers craving more.